AWESOME GIFT!! 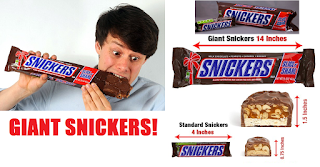 Giant 1 Pound 14" Long Snickers Slice n' Share Chocolate Candy Bar Only $6.40 + Free Shipping. I got this last year and it was a real hit. Somehow it even tasted better than a regular snickers, it was so good. Price dropped again on this and this nos the lowest price it's ever been. YOU HAVE TO BUY IT AT THIS PRICE!! !